Knitting and gaming go hand-in-hand with this collection of knitting patterns! 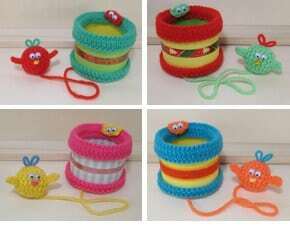 What do you knit for the kids (or adult!) who is getting tired of toys? What if that kid you’d love to knit for seems to care about zilch except video games? Why not try knitted games? That’s right… knitted games. Who knew there were knitting patterns for chess or checkerboards, Legos, mancala, or dice? I had no idea. The ingenuity of knitting designers continues to amaze me. Yes, some of the patterns you’ll find in this collection are purely whimsical and decorative. But most of these actually create playable games that make great gifts for the kids who don’t need another stuffed animal or hat. They also make terrific charity or fundraising projects. Legos: This is actually a combination of knitting and crochet; the crochet produces the little Lego “knobs.” The pattern creates small plush Legos that can be used as is for very young children, as small decorative pillows, or as for the designer, to teach a child to juggle. 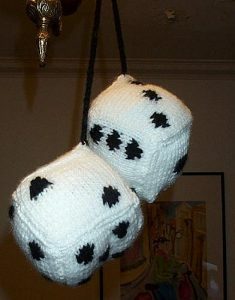 Fluffy Dice: You’ve all seen the “fuzzy dice” hanging from a car’s rearview mirror. Ever think of knitting them? Now you can! This would make a great gift for a teenager who’s just earned their driver’s license. Mancala Mia: I’m blown away by this pattern! I’ve seen mancala sets in many stores, and they are usually not cheap. This is an amazing way to create a mancala board that makes a great gift, especially for kids who travel frequently. Bavgirl’s Felted Jigsaw Puzzle: Just as it says: this produces an actual jigsaw puzzle! What a fun and clever idea. If you have a lot of leftover wool yarn, this is an amazing way to use it. 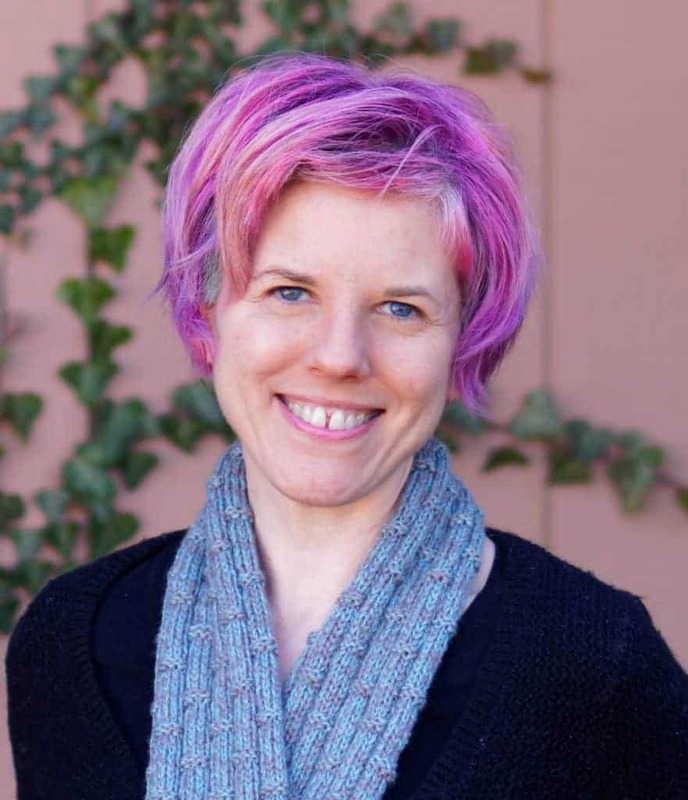 Note: This pattern’s designer, Claudia Purgason, aka Bavgirl, died Nov. 7, 2018. She leaves among her legacies several terrific knitting patterns in addition to this one. You can see them all here. Game On: This delightful pattern creates a rug-sized checkerboard as well as checker pieces! This is a really fun and clever gift idea especially for young children. And, it’s a great way to use T-shirt yarn! 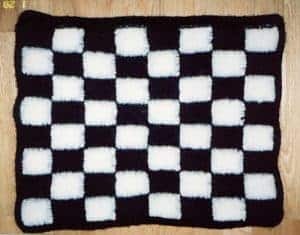 Felted Checkerboard/Chessboard: Another checkerboard pattern, this one is made out of wool and felted (and so becomes a more classic-sized checker/chessboard). I love this pattern because I’m thinking of how well it would travel — just fold it up as small as you can, and tuck into a bag. Fish Story: This is a FANTASTIC gift/charity/fundraising project! It’s beautiful and incredibly functional. 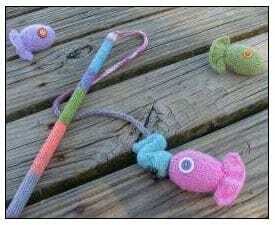 This pattern creates a “fish pond” plus fish, a “worm” for bait, and even a cover for a fishing rod. It’s a great way to use up a lot of odds and ends, too. 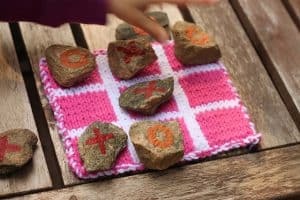 Rockin’ Tic Tac Toe: This pattern creates an adorable Tic Tac Toe board, which you can then use by painting Xs and Os on rocks. This could be another fun gift/charity/fundraising project. I hope you’ve enjoyed this games collection! 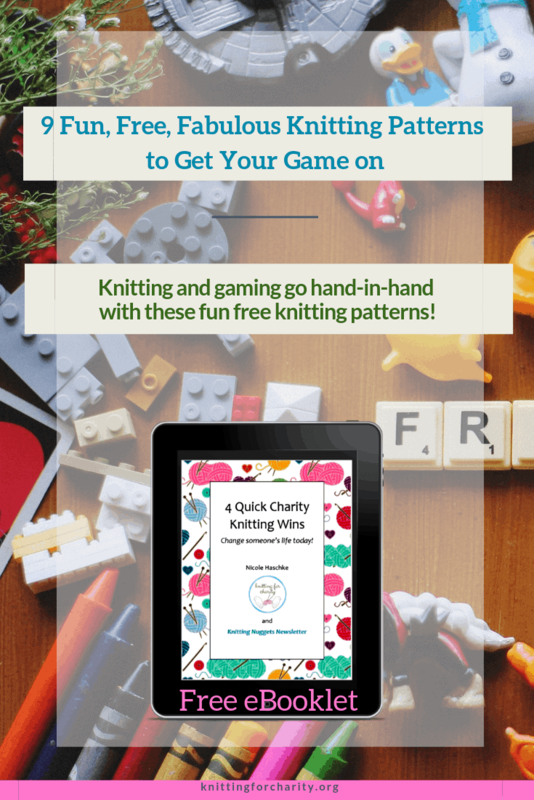 What a fun way to give gifts or to help others, with knitting patterns for games. Want more knitting whimsy? Check out that exact category on this website!